This is a labor of love in salsa form. 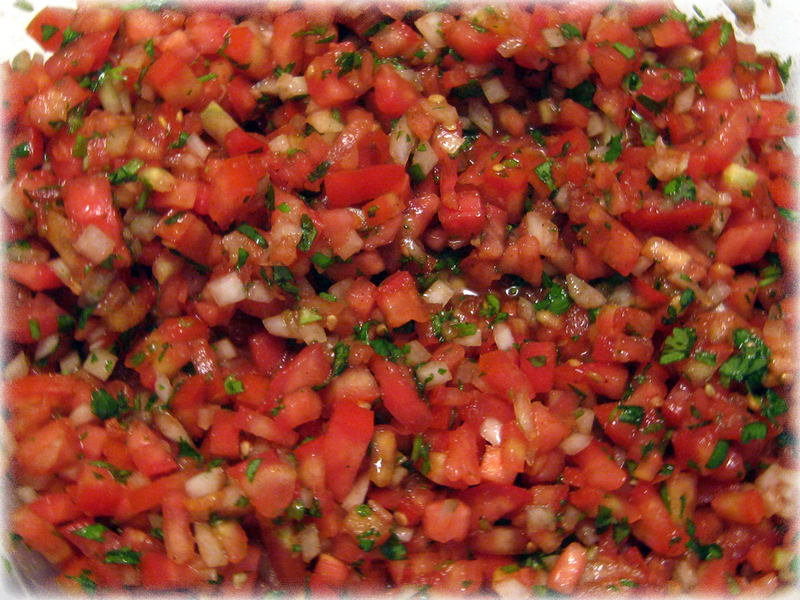 I learned the basic variation of this pico de gallo recipe from two of my long time friends. They made the salsa together and served it with tortilla chips at a cookout where the main feature was grilled clams in their shells. At this barbecue, I also had my first face to face experience with this much cilantro in one dish. I warn you now that this recipe is not for cilantro haters. I always recommend hand chopping the ingredients rather than using a food processor or blender – hence the labor of love. Not only is it immensely satisfying to see the end product, but it also helps regulate the amount of liquid that the salsa ends up with (i.e. a food processor can pulverize the vegetables, so there is too much liquid). Just wash your hands before you start! Makes about 4 cups of salsa (64 tablespoons) with about 80 calories total or about 3 calories per tablespoon. Note: You can use other kinds of tomatoes, but I like using plum tomatoes because they tend to hold their shape better even when ripe so they are easier to cut and give the salsa a firmer texture. Note: You can also use a red, sweet, or white onion, but I like the milder sweet taste of vidalia onions for a salsa like this. Note: Use a little less cilantro if this seems like a lot to you and add more if you like later. Note: I used to make this salsa with garlic, but surprisingly, I prefer it without. Wash the tomatoes and chop them into very small cubes before placing them into a bowl or large tupperware container. Next finely mince the onion into tiny pieces and add it to the tomatoes. This is very important because if the onion pieces are too large every bite will have far too much onion flavor. Mince the cilantro after separating the stems from them (don’t worry if you get a few stems in there – it’s all good stuff) and add the cilantro to the mix. Note: A trick a friend taught me was that if you bunch up all of the cilantro and then sort of fold it over on itself before you start mincing, this really helps you get most of the leaves chopped. You can also use a food processor. Next, add all of your spices (paprika, salt, optional cayenne/jalapeno, and optional chili powder) to the mix and stir together. Optional step: Now you need to roast the garlic before you add it to the salsa. A makeshift bowl made out of aluminum foil will do in a pinch. 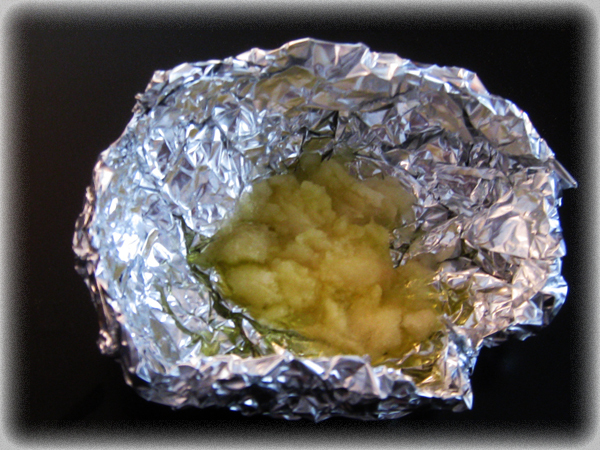 Just bunch it up and create sides, then add the garlic and oil to the foil-bowl. Toss it in a toaster oven under the bake or toast setting or in the regular oven on 375 degrees until the garlic is a golden brown (but not burned!). Then add to the salsa. Note: You can also just sauteé the garlic in a small frying pan with the oil on medium heat. Add the white/apple cider vinegar (or lime juice) and mix the salsa thoroughly. Cover and place in the fridge for at least an hour to really let the ingredients mingle and then serve. Eat this pico de gallo salsa with tortilla chips, put it on tacos, over chili (see my recipe for chili), inside/outside a burrito, over chicken or fish, over beans (see my beans recipe). mixed with rice or just by the spoonful! A labor of love, indeed! That looks delicious!